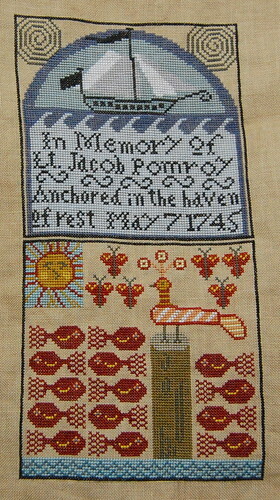 Nicole's Needlework: Shores Block #8 Finished! 40 ct. Summer Khaki (over-dyed with Tan Rit Dye), NPI silks (1 over 2). The only thing I didn't stitch is the rigging. I decided to wait until the end because I'm afraid I will snag my finger on it. I pulled the threads for block #4 today. They're so pretty! I'm going to either get started on it or work on Sampler of Stitches some more. Cynthia asked what colors I'm using for SoS. I'm using all the recommended Au Ver a Soie colors except I changed 3815 to 3813 and 4231 to 4232. P.S. I feel absurdly happy that you're stitching blocks in order of climbing vertical column; it's fun to see the "layout" this way,even temporarily. Congrats on finishing up another block Nicole. It looks lovely. Great progress, Nicole. I know what you mean about this block, though - I think it took me two months to complete. I didn't do the rigging either - I want to leave it until the end. It looks wonderful Nicole. I know how much stitching goes into the block. Did you feel that it would never end? I was going to put my father's name in my block since he was in the Navy, but since I haven't stitched it yet, I have a funny feeling I'm going to leave the piece as is. Sometimes my brain can comprehend a lot of changes. Can't wait to see progress on the next block. Beautiful! It makes me to feel like I want to go to the beach right now. But you know where I am, there is no beach in Arizona!!! Congrats on a beautiful finish on this block. It is the block I was on and still need to finish! Lots and lots of stitching on it and yours is just beautiful!! I should get mine finished too!! Beautiful square, look forward to seeing the next one. Congrats! That's the most time consuming block of the piece and you have it over with! Yay! It's looking wonderful! You are an amazing stitcher. I need to get mine out, and finish it. I stalled on the ship. It doesn't help that this block is next in line, and it's so solid! Yuck. Your helping get inspired though. Thanks for Chi's blog address. Wow! Amazing work she does. Good job on another block!! Looks great!! looking good! i have debated on buying this one to stitch up but the more i see yours stitched up it might just sway me. 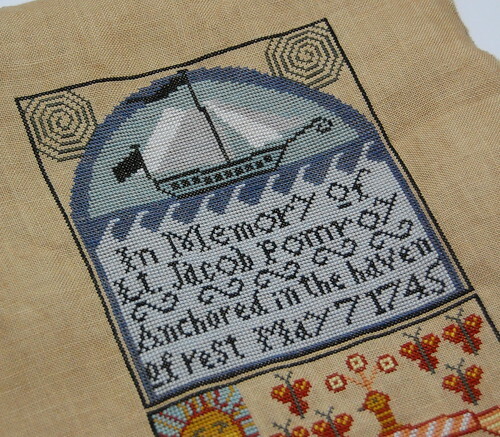 Those solid blocks are very time consuming, but you seem to have stitched it very fast. Lovely stitching Nicole - congrats on finishing another block! Lovely stitching. Congratulations on finishing another block. Oh you've inspired me - I need to get back to working on my Shores. So pretty! The block looks gorgeous Nicole. I am half way through it and like you finding the filling in tedious. But I am determined to plod on with it. It's my second block too and I think my next block will be the one above it.